The airfield Stadtlohn - Vreden is located in the middle of the Westmuensterland in Kreis Borken. 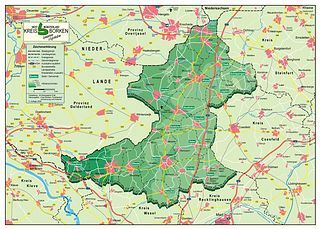 In the north of North Rhine-Westphalia the Kreis Borken borders on the county Bentheim in Lower Saxony. The Netherlands with the region Achterhoek is situated in the west. Achterhoek is part of the province Gelderland. For more informations about the surrrounding cities and the region Westmuensterland, like hotels, restaurants and sights, please use one of the linkings below.